Where to Play Multiplayer Avalon for Real Money? While multiplayer online slots aren’t exactly an entirely new concept, they’re still rare and unique enough to have that feeling of odd novelty about them. Typically, you wouldn’t think of slots as a particularly social, cooperative or even competitive game. However, in this world of connectivity that we live in today, even betting can become a social activity. Avalon has a regular, single player version too, which is more or less a run-of-the-mill slot that has been adapted to a new multiplayer model. There are some differences between the two versions beyond one being multi- and the other being singleplayer. This slot has more features to offer beyond simply being multiplayer, such as special bonuses that make playing with others worth it all. How to Play Multiplayer Avalon Casino Game? Sharing many characteristics with its single player version, Multiplayer Avalon features five reels and 20 paylines - which might seem a tad few to some players. Avalon has been around for quite some time, and grew to be one of Microgaming’s best known classics. However, in terms of popularity it has been overshadowed by some of Microgaming’s other, more recent slots. The multiplayer twist seeks to bring new life to the cult classic. The betting limit in the multiplayer version is higher than the solo original, starting at 1 and going up to 200. This makes this a pretty high-stakes game, though its volatility isn’t considered high, and the payout rate is at about 97% making up for the high betting floor. Multiplayer Avalon packs the same play features as the original, plus an additional twist brought in with the multiplayer aspect, which urges players to bet high and keep pressing that spin button. Wild symbols in Multiplayer Avalon have two variants. An image of the castle of Avalon acts as the wild during regular spins, and each of these appearing in your reels will double your winnings regardless of whether or not you achieved that particular payline. During free spins, a different wild symbol with the same effect is introduced in the form of a treasure chest. The scatter symbol in this game is the Lady of the Lake - and while she doesn’t grant you Excalibur, the reward more than makes up for it. Hitting three or more of these will activate 12 free spins with a random multiplier ranging from x2 to x7. Hitting three or more scatters during the free spins re-triggers them, making this a great way to stack up winnings. Multiplayer Avalon encourages brave betting on everyone’s part in order to maximise winnings. While there are some basic multiplayer features like chatting and viewing each other’s slots, the main feature here is the “community free spins” bonus. There is a shared multiplier meter which increases based on how frequently you spin and how high you bet. The higher the bets and the more the spins, the higher the multiplier will be when the free spins trigger. Keeping it high is a team-effort, requiring all players to throw in good amounts of cash - however the payout will be more than worth it with a maximum of an x90 (yes, you read that right. x90) multiplier. 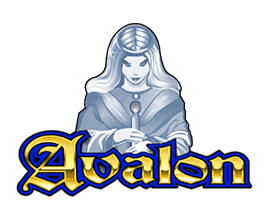 While regular Avalon may not be a high-octane slot by any measure of the word, Multiplayer Avalon, with its high betting minimum and exciting rush to keep the community multiplier meter at the maximum is guaranteed to make you feel like you’ve just returned from a true medieval fantasy adventure when you’re done playing. Multiplayer Avalon takes a forgotten classic and pretty much reinvents the wheel (or slot machine) by adding extremely fun and exciting multiplayer features to a game otherwise played alone. If the high betting range isn’t too much for you, this is definitely worth both your money and time!